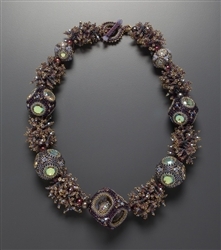 This beautiful one of a kind necklace is comprised of five beaded beads made vintage Swarovski crystals. Adorned with crystal and pearls, this stunning necklace is truly a work of art. Finished length of the necklace is approximately: 21 inches. Center beaded bead is 1.25 X 1.25 X 1.25 inches.